In-form teams East Bengal and Real Kashmir FC will look to top the points table when they lock horns in a crunch I-League encounter at the Vivekananda Yuba Bharati Krirangan in Kolkata on Friday. “It will be a tough match and we have to be attentive. We are hoping to win tomorrow. We don’t want to lose tomorrow’s game. We have to fight for 90 minutes. We are confident of winning tomorrow. They defeated Chennai City, so they are a tough team but we have to win,” hosts’ Spanish coach Alejandro Menendez said on the eve of the game. Praising Real Kashmir, Menendez said they have to be ‘formative’ at the back. 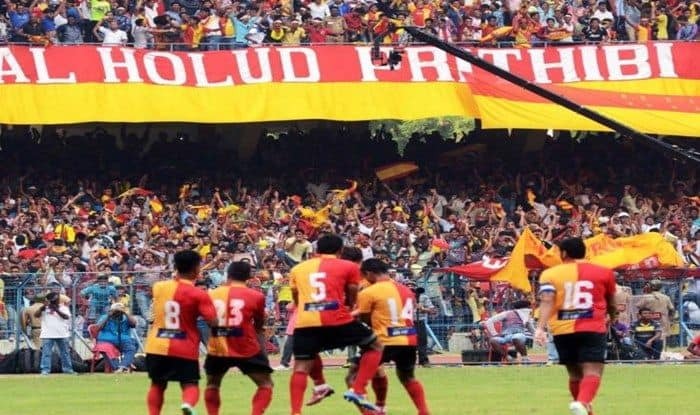 East Bengal’s defenders, led by Costa Rican World Cupper Johnny Acosta, have done a good job so far and their coach expressed confidence that they would be able to stop Real Kashmir’s strikers. “We have to be very formative in our defence. We are working hard on that. But I am confident our defenders will deal with their strikers,” Menendez added. East Bengal do not have any injury concerns ahead of the tie but forward Bali Gagandeep would be unavailable for selection owing to suspension. Coming to the visitors, their Scottish coach David Robertson said that the games against traditional giants East Bengal and Mohun Bagan will dictate their fate going forward, adding that his team’s second spot in the league table has taken him by surprise too. Real Kashmir lost to Mohun Bagan at home last month, their second defeat so far this season. “I’m surprised myself actually to see where we are. It may be in a false position but the games against East Bengal, Mohun Bagan will dictate where we end up in the season. After our game against Mohun Bagan, we will know exactly where we’re heading in the season,” Robertson told reporters. Asked if there is added pressure to perform, Robertson said a win for Real Kashmir on Friday would be a “shock” despite the league standings. “East Bengal and Mohun Bagan are the biggest clubs in India. They have the biggest budgets. I’ve been with big clubs in Scotland too, and playing with big clubs brings a lot of pressure. The pressure is on them to get results. If we don’t get result, who cares. But if we managed to get something, then it’s a big shock,” expressed Robertson. Real Kashmir will be missing the services of key defender Mason Robertson, who is ruled out with an injury. “We are not looking too far ahead. Yes, we beat Chennai. As I said, there was no pressure on us. We just wanted to make sure that we need to finish high up,” he concluded.